The New York group - famed for tracks such as Blitzkrieg Bop, I Wanna Be Sedated and Sheena Is A Punk Rocker - were recognised with the Icon Award at the annual Kerrang! Awards. 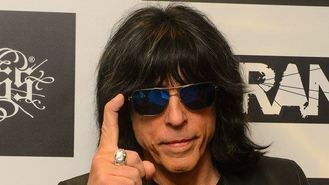 Long-time drummer Marky Ramone - who spent a total of 15 years in the band's line-up - attended the ceremony at London venue Troxy to collect the prize. Other honorary winners were veteran stars Status Quo who took the Service To Rock prize, while Deep Purple were given the Hall Of Fame award. The Ramones - whose members all adopted the pseudonymous surname Ramone - were famed for their rudimentary three-chord approach to their songs which exemplified the "anyone can form a band" attitude to punk. The group's most famous members, Johnny, Joey and Dee Dee, have all died and Marky replaced original drummer Tommy in 1978. Despite their worldwide influence, the highest the band's albums ever reached in the UK charts was number 14 in 1980 with their End Of The Century release. Their highest single came the same year with a cover of the Ronettes hit Baby, I Love You. Other winners at tonight's event - officially called the Relentless Kerrang! Awards - included You Me At Six who took the Best Single prize for Fresh Start Fever and were named Best British Band. Fall Out Boy were also double winners with trophies for Best International Band and Best Event for their Save Rock And Roll Tour.